Your stunning personalised chopping board is a fantastic gift for foodies and budding chefs. Beautifully printed with your photos or special messages, preparing ingredients just got a whole lot more exciting. Your personalised cutting board is made from super strong, hygienic stonemax, and is available in 3 sizes. Your custom made chopping boards are a kitchen delight, allowing you to cook in unique style. They're made from strong and durable Stonemax, a premium kitchen worktop material that is non-porous, antibacterial and easy to clean. Due to its non-porous finish, it is more hygienic than traditional wooden chopping boards, especially when it comes to food preparation. Your personalised chopping board is available in 3 sizes, all beautifully printed with a stylish 3D wrap around effect. Care: Your custom made chopping boards are super easy to clean, but do not put in the dishwasher. Wash my hand with antibacterial washing liquid and warm water. They are more hygienic than traditional wooden chopping boards, as the material is non-porous, preventing bacteria from building up on the surface. The stonemax material is certified to FSA standards and is heat resistant up to 120°c. Your personalised chopping board is handmade to order in our studio, resulting in a beautiful bespoke gift. Your photos are printed onto the strong stonemax material in your chosen size and finished with a contemporary 3D wrap around effect on the sides. This adds depth to your design, giving it more character and personality. The print is permanent, as we use a specialist process that fuses the ink deep into the material. Your photos or design are printed onto the Stonemax board and given a 3D print wrap for added impact. Every detail is handled with care to make sure the finished board is nothing short of excellent. Do You Have any Design Tips? Traditionally, cutting boards are personalised as landscape, however you can of course print a portrait photo and use the board how you wish. The print wrap around the sides gives your board a cool and contemporary finish, where the edges of your photos slightly fade out over the curved sides. Colours are vibrant, and details come through extremely well, with a high definition finish. They add a decorative touch to any lacklustre kitchen, bringing extra warmth and character to the home. If this is a gift for your foodie friend, make them a personalised chopping board that gives them inspiration. You could print a gourmet recipe or something exotic that they can rustle up without the need for a book. This is a stunning gift that can be enjoyed for years and years, thanks to the deep, rich permanent print. 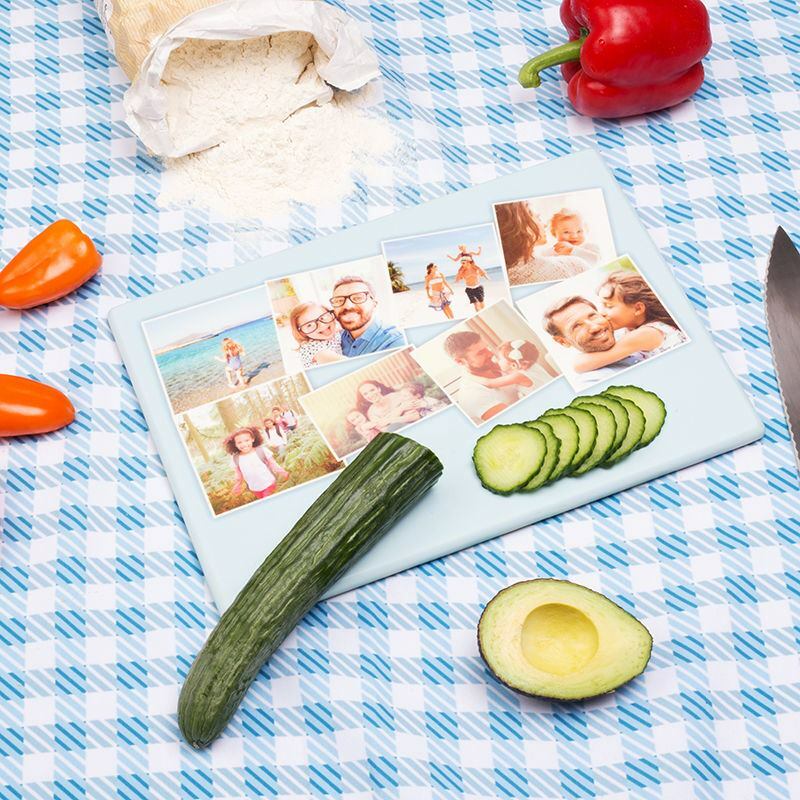 As an addition to the family kitchen, your custom made stonemax chopping board would look amazing printed with a favourite photo featuring all your relatives. Eating together is a wholesome family tradition, so even when everyone isn't there, you can prepare your meals on a cutting board that brings back happy memories. Chopping boards personalised with a photo and special message are a contemporary take on a classic wedding gift. Design a totally unique custom made board for the newlywed couple, and it'll double as a sentimental keepsake too. As they cook together as husband and wife, they can be reminded of their big day. Why not design a whole set for yourself, or for a special gift? This beautiful personalised cutting board allows you to slice, dice and chop vegetables, meat, fruit and more with the utmost pleasure. They also make excellent artistic platters to show off foods, hams, cheeses, and finger foods. Your custom made boards for chopping come with a quantity discount, so buy more than one today and save money on your personalised gifts. Custom printed tablecloths. We print and sew your table cloth into beautiful wedding or event table linen or display. Create personalised photo glass chopping board makes a great home wares gift and worktop saver for you or someone's kitchen.